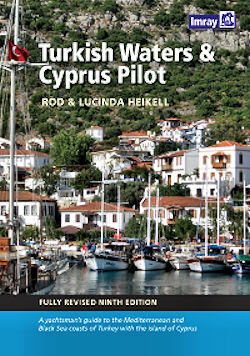 Turkey - east Lycian coast sailing and yacht charter guide - Fethiye, Kas and Antalya ports and anchorages - gulet cruises, sailing holidays and yacht charters. The east Lycian coast is much less indented than for instance the Carian coast, yet the stretch of coastline between Kalkan and Finike does offer quite a few must-see secluded coves and bays. 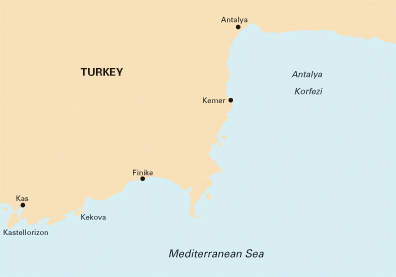 Like the west Lycian coast its terrain is rather mountainous and inaccessible. The main yacht charter bases can be found in Fethiye and Antalya. In this remote region the sites of over thirty cities have been found which allows us to study the culture of the Lycians. The most obvious features of the Lycian landscape are the tombs and sarcophagi left behind. They are everywhere and it is difficult not to think of the region as a vast necropolis peopled with the shadowy figures of Lycian nobles and warriors. Ancestor-worship was evidently important to the Lycians and the tombs are extravagant affairs, the more grandiose decorated with a frieze and inscriptions placing a curse upon anyone tampering with the tomb. With the decline of the Roman Empire, so too Lycian fortunes declined. In Byzantine times there were small settlements around the coast, a number of Byzantine churches will be seen in isolated spots, but the interior was not heavily populated as in Lycian times. In the late Middle Ages this region was viewed as a wilderness, and the coast yet again harboured pirates. Pillar-tombs are specific to Lycia and were for important dynasts. Temple-tombs are maybe the most impressive of the Lycian tombs and consist of a temple facade with a grave chamber behind it. House-tombs were modelled on the wooden houses of the Lycians and so give us some idea of what everyday accommodation was like several thousand years ago. Pigeon-hole tombs were the down-market version of temple and house tombs, small unadorned chambers cut into a cliff-face. Sarcophagi are ubiquitous: even submerged where land retreated. In Roman times the sarcophagi became smaller and less ornate, perhaps as the importance of ancestor-worship declined. These eastern Lycian coasts are as beautiful as they are rugged, harbouring an abundance of cultural sites, notably: Fethiye, Kalkan, Kas, Finike and Antalya. The remains of several ancient cities like Aperlae, Myra, Kale, Olympos and Phaselis can easily be visited by yacht. 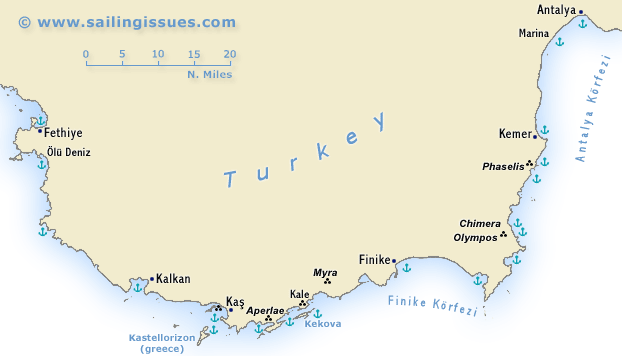 Between Kas and Antalya, the meltemi wind - even in high season - can let you down for days or weeks, and often sailing yachts will be seen motoring to the next anchorage or port. In these poor conditions, visibility is usually low and the air moist. Yet, even in these tranquil conditions you will have to anchor safely to allow for the evening land breeze. The area is famed for its blue translucent seas and certainly less crowded than the Marmaris and Fetiye area.